Rebecca, starring Joan Fontaine (left) and Judith Anderson, is one of the 1001 classic movies you should see. Each Monday, I'm going to recommend a classic movie you should see (for the reasons behind the 1001 series and reviews of earlier films covered go here). Today, I'm continuing February's theme of Love and Marriage Hitchcock Style, with a look at director Alfred Hitchcock's first American film, Rebecca. Rebecca tells the story of a shy young woman (Joan Fontaine) who works a a paid companion for a rich society lady (Florence Bates) in Monte Carlo. One day, she meets an aristocratic widower, Maxim de Winter (Laurence Olivier), and they strike up an unlikely romance. 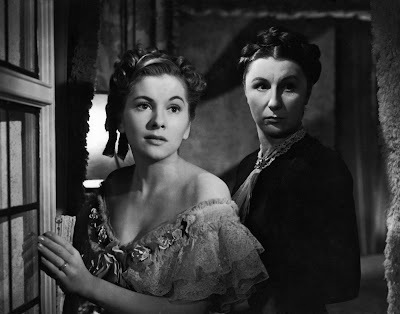 The young woman (she doesn't have a name in the movie) eventually marries Maxim and returns to his palatial estate, Manderley, where she must contend with memories of his glamorous first wife, Rebecca, and the disdain of the formidable housekeeper, Mrs. Danvers (Judith Anderson). Rebecca is based on Daphne du Maurier's best-selling Gothic horror novel. Independent producer David O. Selznick, who was known for lavish adaptations of literary works, quickly bought the rights to the novel after it was published in 1938. 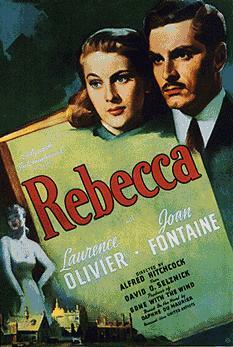 Selznick brought in Hitchcock, who was much sought after in Hollywood after his British films became international hits, to adapt Rebecca for the big screen, but the pair didn't always see eye to eye during the production. Selznick frowned on Hitchcock's attempts to bring humor into the story and to change the plot from the original novel (according to Patrick McGilligan's Hitchcock biography, Selznick literally urged the director to have Fontaine cry more). Despite their differences, the two men were able to work together and create a movie that was a huge hit and won several Academy Awards, including Best Picture. Rebecca is one of Hitchcock's more interesting portraits of married life because it actually focuses on two marriages: Maxim and Rebecca's and Maxim and the second Mrs. de Winter's. The glamorous, beautiful Rebecca effortlessly dominated the first de Winter marriage, and her memory very much dominates the second Mrs. de Winter's life. In fact, the film seems to say that marriage is not an equal partnership, but more of an unequal relationship where one person's will must dominate over the other spouse in order for the union to be successful. Hitchcock illustrates this point of view through Fontaine's character. She begins the movie as a mousy schoolgirl, but, as she gains power over Maxim because of the revelation of his dark secrets, she begins to take control of her own destiny and become mistress of Manderley in her own right. 1. The plot. Rebecca has an unusual plot structure, especially for a Hitchcock film. The first third, which takes place in Monte Carlo, is a light romance with Mrs. Van Hopper offering much of the comic relief. The middle section is an atmospheric horror film filled with fog and shadows that builds into a suspenseful climax during the famous costume ball scene. The final, and I think weakest, part of the film becomes an old-fashioned whodunit about Rebecca's mysterious death. 2. Olivier. Maxim is one of Olivier's best and most understated screen performances. He was severely disappointed that his great love Vivien Leigh wasn't cast as the second Mrs. de Winter, and he was often grumpy and/or disinterested during filming. Olivier's disgruntled state actually works for the film, and helped him play a man who is too distracted by the past to pay all that much attention to the present. 3. Manderley. Hitchcock uses brilliant camera work to make Maxim's palatial estate into a dark. brooding place of fog and shadow, especially in the famous opening scene. 4. Anderson. She was a great classical stage actress, who had only appeared in one film before Hitchcock persuaded her to play the formidable Mrs. Danvers. Anderson, who gives one of the great screen performances of the 1940's, creates a brilliant portrait of obsession that cleverly implies feelings that the strict production code usually quashed. Joan Fontaine and Laurence Olivier in Rebecca (1940). Other critics: Rebecca is one of the few movies that are certified 100 percent fresh at Rotten Tomatoes, and Leonard Maltin calls it "sumptuous" in a four-star review for his Classic Movie Guide. Critics in 1941 were equally impressed by Rebecca. Frank S. Nugent of The New York Times raved that Rebecca was "an altogether brilliant film, haunting, suspenseful, handsome and handsomely played." Variety praised the film, but the reviewer thought it might be too much for forties audiences to handle, writing that Rebecca was "too tragic and deeply psychological to hit the fancy of wide audience appeal." Fortunately, the reviewer was wrong. The bottom line: Rebecca sags a bit in the final third of the film, but it is still one of Hitchcock's best movies, filled with top-notch performances and Gothic chills. Availability: Rebecca is available on DVD, Blu ray and at the Internet Archive. Next Monday, I'll continue the February theme of Love and Marriage: Hitchcock Style with a look at Rear Window (1954).